DNT BOB 88, Patch Bay from Lectrosonics. Lectrosonics introduces the DND BOB 88 general purpose interface to transmit and receive line level analog audio signals via a Dante network. 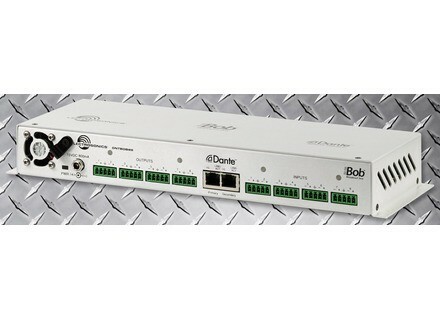 Analog inputs are converted to digital and appear on the network as transmit channels. Audio for the analog outputs is taken from subscriptions to transmit channels on the network from other sources. When connected to a network, each break out box will appear as a separate device in the Dante Controller software interface. MSRP is $1905. More details at www.lectrosonics.com. [Musikmesse] SPL MasterBay S SPL introduces the MasterBay S Patchbay at this year's Musikmesse. Sonifex Redbox RB-VHDDD8 Sonifex introduce Redbox VHDDD8 & VHEDD8 which are Dolby E & Dolby Digital Decoder/De-Embedder and Encoder/Embedder respectively.